Maryna Allan is an International Teacher, Speaker, Energy Coach, Healing Facilitator, and co-owner of Be The Change Energy Center in Los Angeles, CA. She regularly travels to teach Qigong, Energy Medicine, & ‘BE Energy Fitness’, and to offer private Energy Medicine Balancing Sessions and Hummingbird Medicine. White Feather Retreats offers holistic health, spiritual development, Qigong and Energy Medicine Retreats in national and international locations. 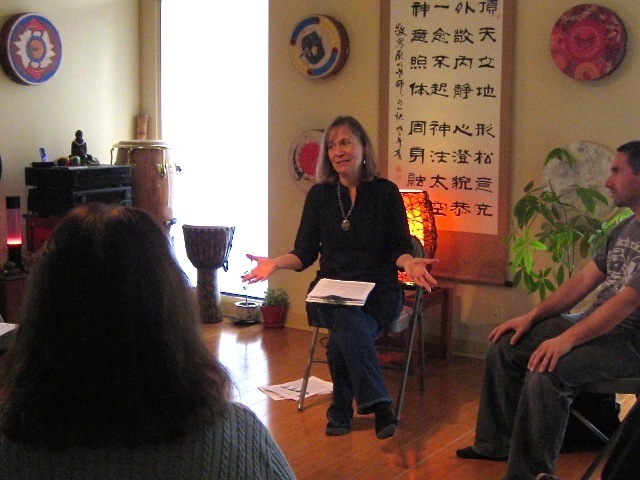 Maryna is a Qigong Instructor and Certified “Eden Energy Medicine Practitioner” teaching the work of Donna Eden – renowned teacher and author of the book “Energy Medicine,” which is published in 19 languages. Maryna helped to found the new Hexianju Qigong Center on tropical Hainan Island in China, where she takes groups on Retreats. She has extensive training in Qigong from the National Medical Qigong Training Base in Beidaihe, China as well as in Hainan. As an educator, she directed children’s educational and dance programs in Hawaii for 20 years before moving to Los Angeles in 2007. She also began her early training in energy healing and Hooponopono in Hawaii with Renown Hawaiian Kahuna Lanakila Brandt and with Dora Kunz, PhD in Nursing at NYU and co-founder of Therapeutic Touch, which is practiced in Hospitals worldwide. She was also fortunate to study Hooponopono (SITH) with Dr. Hew Len in 1995 and includes Hooponopono in private sessions and in daily life. Maryna has worked in the field of Energy Healing for 28 years and holds a BA from San Diego State University in Dance/Physical Education and an MFA in Dance Choreography from Arizona State University. Since 2010 she taught Qigong and Energy Medicine at Pierce College and the Be Energy Center in Los Angeles, as well as on tour in Malaysia, China, Singapore, Bali, the UK and Nationally. Both corporations and school systems have approached Maryna to train their staff in order to increase productivity and reduce stress and illness-related absences. Most recently, Maryna was featured on The Sacred Science’s online ‘Energy Healing Video Series” where she teaches simple Qigong methods, Energy Medicine Exercises to reduce stress and balance your energies, a basic muscle/joint warm-up for all ages and a fun Energy Dance for Kids. Her innovative movement program is called “BE Energy Fitness” and integrates Qigong movement methods and meridian/acupuncture point tapping with gentle stretches and movements for the joints and muscles. These compliment Eden Energy Medicine Exercises and work together to clear blockages and open the body’s energy pathways and centers. Vitality, the immune system, mental clarity and overall energy is thus restored with consistent practice. Moreover, Be Energy Fitness is fun to do and helps one to regain energetic balance and a sense of inner peace.